SHANGHAI - While the rest of the village sleeps, Lu Lixiang and his band of volunteers safeguard their sweet dreams. Lu, a factory manager by day, transforms into a patrolman at night, driving the streets in his own car and keeping his eyes peeled for thieves and others up to no good. "About six years ago, our village faced continuous security problems such as thefts," said Lu, whose factory in Jinshi village, Zhejiang province, makes polyurethane fibers used to produce socks. Thieves were frequently stealing the materials and selling them to producers at a discount, seriously affecting production in the factories, Lu said. With the help of local police, the volunteer patrol team was rallied in 2005. The team consists of some 40 members - mostly managers of private factories. 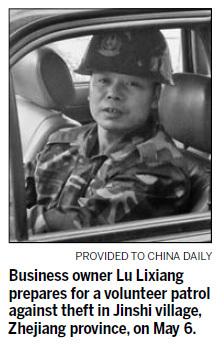 "The thieves were growing even more crafty," said Lu, 41. "They wouldn't steal a whole box of polyurethane fiber at once, so people at the factory wouldn't notice right away. Instead, they would steal a little bit at a time and sell it once they had collected enough. That was really a nuisance." "Thefts are even more rampant around Spring Festival, and it usually takes some time for the police to deal with each case," Liu continued. "After talking with friends and village officials several times, we thought it would be a good idea to take care of the patrol work ourselves." The six teams rotate nights, keeping an eye on the safety of the village's nearly 4,100 people and its 120 companies. "We found two men behaving weirdly one night. When we were about to ask them to stop for an inspection, the two instantly turned around and ran away, dropping a mobile phone on the ground. We thought they might come back to get the phone later and waited for a while. As we had expected, the two did come back to retrieve the phone and we caught them right on the spot," said Lu, hardly able to conceal his laughter. Lu talks to his fellow members about the details of each capture, and makes sure everyone is safe. "If it's really late at night, local police will provide each of us with a bowl of noodles as a midnight snack. But of course, we aren't doing this volunteer work only for noodles," Lu said with a big laugh. In fact, the team pays for any extras itself, including gas for the car. "Sure we have to sacrifice some of our personal time. But with our families' support, we are happy doing this as we hear the villagers are sleeping sounder with our patrol team marching around," he added.